Missing the point is a recurring theme in the assigned readings for Proper 5. Psalm 74, an exilic text, asks why the Babylonian Exile has occurred. Deuteronomy 32 and Isaiah 5 answer the question; faithlessness, evident in idolatry and rampant in institutionalized social injustice is the cause. Certain opponents on Jesus accuse him of being in league with Satan when he casts out demons (in the Hellenistic world view). However we moderns classify whatever Jesus did in exorcisms, that is not a point on which one should fixate while pondering the texts from the Gospels. No, that is not a sin either. You must have worried yourself to death. Falling into legalism and condemning someone for playing bridge or for having an occasional drink without even becoming tipsy is at least as bad as failing to recognize actual sins. Children, love must not be a matter of theory or talk; it must be true love which shows itself in action. This is how we shall know if we belong to the realm of truth, and reassure ourselves in his sight where conscience condemns us; for God is greater than our conscience and knows all. Love does not object when Jesus cures someone on the Sabbath or any other day. (Consult Matthew 12:1-14) for the Sabbath reference.) Love does not seek to deny anyone justice, as in Isaiah 5:23. Love does not compel one to seek one’s own benefit at the expense of others. Love is not, of course, a flawless insurance policy against missing the point, but it is a good start. A typically Jewish way of speaking and writing about God is to recall what God has done. After all, God is like what God has done. Furthermore, we are like what we have done, although we are far more than the worst deeds we have committed. The relevant issue is the pattern of what we have done and of what we are doing. Repentance is possible, after all, and the past is not necessarily accurate in predicting the future. Consider with me, O reader, the assigned readings for this Sunday. The two options for the First Reading proclaim divine judgment upon the faithless, for whom God has done much. The faithless should know better. Perhaps they do know better, but they are not acting as if they do. The lection from Isaiah 5 follows the famous passage likening rebellious Israel to a well-tended vineyard that yields wild grapes. God will judge that vineyard, we read. Likewise, we read of faithless Israel in Deuteronomy. If Richard Elliott Friedman is correct, lurking in the background of the text is a condemnation of polytheism. God is, after all, insistent upon monotheism in the Hebrew Bible. If Dr. Friedman is correct, faithlessness to YHWH entails turning to supposedly subordinate deities, members of the divine council–a concept Hebrew prophets opposed vigorously. In contrast to those lections we read Psalm 142, the lament of a dying man whom other mortals have abandoned. This man, contemplating the imminent unknown, turns to God alone. One may assume safely that God is faithful to those who demonstrate fidelity. The passage from Philippians belongs to a section of that epistle in which one finds advice regarding how to live faithfully in community. People are to think about each other and model their lives after Jesus, whose humility and selflessness is certainly challenging to emulate. In this context the customary verses about people with polysyllabic names take on more importance than they might otherwise; these verses model the attitudes and behaviors the preceding verses extol. People are like what they do. The three options for the Gospel reading are parallel versions of the same story, set immediately after the Transfiguration of Jesus. One might fixate on the typically Hellenistic diagnosis of epilepsy as demonic possession, but to do so would be to miss the point. In the narrative the Apostles have just learned of Christ’s true identity in all of its glory, yet they have not grasped this revelation, and were therefore ineffective. The lesson for we who read these stories thousands of years later is to ponder whether we grasp who Jesus is and whether we are as effective as we can be in our discipleship. Our challenge in this regard is to render proper thanksgiving to God in our lives. We can do this only be grace, of course, but our desire to pursue this course of action is also essential. Obstacles include laziness, fear, selfishness, cultural conditioning, the pressure to conform, and simple obliviousness. If we are to grow into our full spiritual stature, however, we must seek to follow and honor God and to trust in divine grace. may they be wrapped in their own shame as in a mantle. Justice, according to Psalm 109 and Isaiah 26, is for God to deliver the faithful and to smite the evildoers. I understand the sentiment well, just as I also grasp the reality that prolonged anger can easily become a spiritual toxin. In small doses and for brief periods of time it might help one make the proper decisions, but its toxicity becomes apparent quickly. One does better to pray for one’s persecutors, that they may repent, and leave the rest to God. Not all will repent, unfortunately, and those who persist in perfidy will bring their fates upon themselves. At the time that their foot falters. And destiny rushes upon them. And neither bond nor free is left…. O nations, acclaim His people! And cleanse the land of His people. In the Lukan account of the healing of the paralyzed man he glorifies God immediately, and witnesses become filled with amazement because of the miracle. It is easy to maintain faith in God during good times, but a different matter during difficult times. That is part of the reason for the existence of the Letter to the Hebrews, with its encouragement of perseverance and warning against committing apostasy, of falling away from God. I have learned via living that faith in God is essential to getting through dark chapters in life as well as possible. 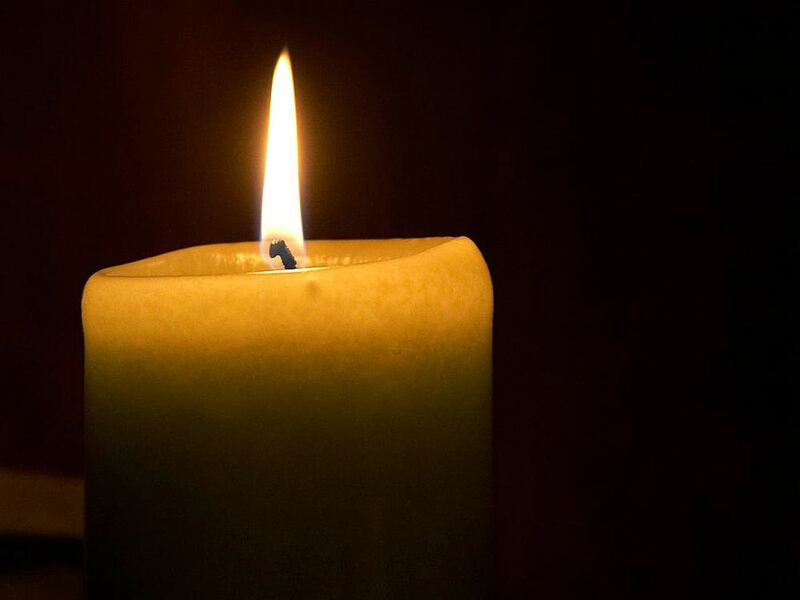 I have also learned that the light of God seems to burn brightest in the darkness and that grace seems most evident during times of distress. The faithful do not walk exclusively in paths of pleasantness. Neither do they walk alone. They trusting in God, can focus on the positive and seek to build communities of shalom. you call us to obey you, and you favor us with true freedom. St. Paul the Apostle was perplexed with the Galatian Church. Many members of it had reverted to idolatry or to the Law of Moses, both of which he considered to be forms of spiritual slavery. As he instructed the Corinthian Church, the proper course of action was to pass the test and remember that they carried Jesus Christ inside them. In Christ, according to St. Paul, was liberation, although not to engage in negative activities, but to build up the faith community, and to pursue virtue (2 Corinthians 12:19-21). The theme of rebelling against God unites these days’ readings. Nadab and Abihu, sons of Aaron, laid incense upon their fire pans in violation of divine instructions. This constituted sacrilege and an attempt to control God. Further, the sin of the two brothers was not simply that they went too far in their super-piety. Rather, they acted in utter disregard for the deity. God intended that the manifestation of His Presence would ignite the altar fire, marking His acceptance of His people’s devotion. Their intent was for the divine fire to ignite their own pans; that is, they were attempting to arrogate control of the deity for themselves. Divine fire consumed the two priests. Disregard for God was present in the population as a whole. Idolatry and arrogance were difficult habits to break. This was true in Biblical times, as in the days of Elisha. It was true in the time that Jesus of Nazareth walked the face of the earth. It remains true today, for human nature is a constant factor. God is a consuming fire. Fire is a destructive force, reducing much to ashes. Yet destruction is frequently part of a creative process, as in the renewal of ecosystems in forests. Divine fire destroys the corrupt and idolatrous, and arrogant so that seeds of fidelity, justice, and humility may germinate. Jesus faced a difficult decision, and he resolved to take up his cross. His challenge to the Apostles to do likewise has applied to members of generations for nearly 2000 years. Will we be faithful or will we seek the easy way out? Will we turn away from the truth, or will we act as people with Jesus Christ in them? Will we follow the fire of the Holy Spirit or will we risk the fire of divine punishment? Sovereign God, you turn your greatness into goodness for all the peoples on earth. I will lift them up, because they know my name. I will deliver them and bring them to honour. 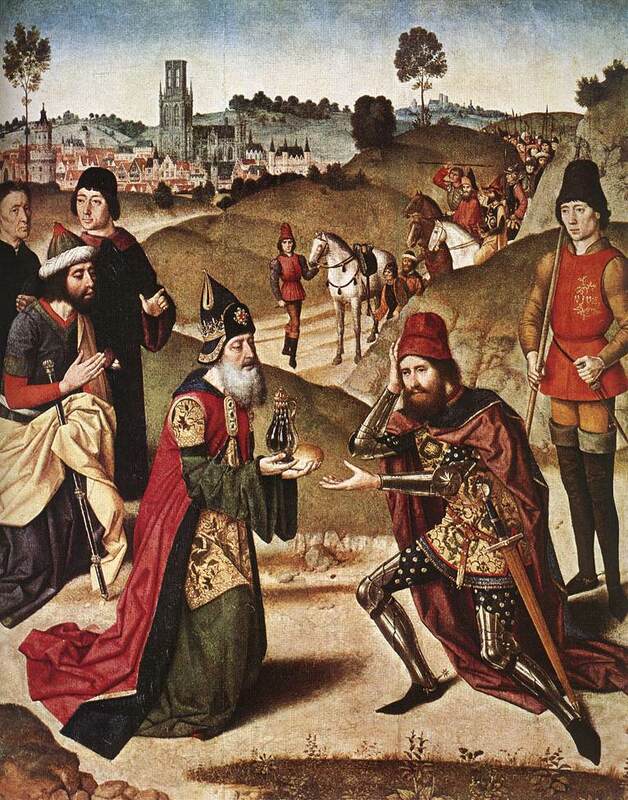 Who was Melchizedek? He was a mysterious figure, the King of Salem (Jerusalem) and a “priest of the Most High” (Genesis 14:18, TANAKH: The Holy Scriptures). “The God Most High” might have been Yahweh; the text is ambiguous. So Melchizedek, to whom the victorious warrior and patriarch Abram (Abraham) paid a tithe might have belonged to a pagan cult. If so, the patriarch paid homage to a pagan deity. On the other hand, Melchizedek might have been a Gentile devotee of Yahweh. Sometimes one wishes that certain Biblical texts were unambiguous. Interpreting “the God Most High” to mean Yahweh meshes well with Romans 15:7-13. St. Paul the Apostle, who quoted, in order, Psalm 18:49, Deuteronomy 32:43, Psalm 117:1, and Isaiah 11:10 (all from the Septuagint; sometimes that translation contains some words crucial to his point and absent from other versions), argued that God calls both Jews and Gentiles. The Gospel is therefore inclusive. Romans 15:7-13 brings up issues far beyond Jewish-Christian relations. 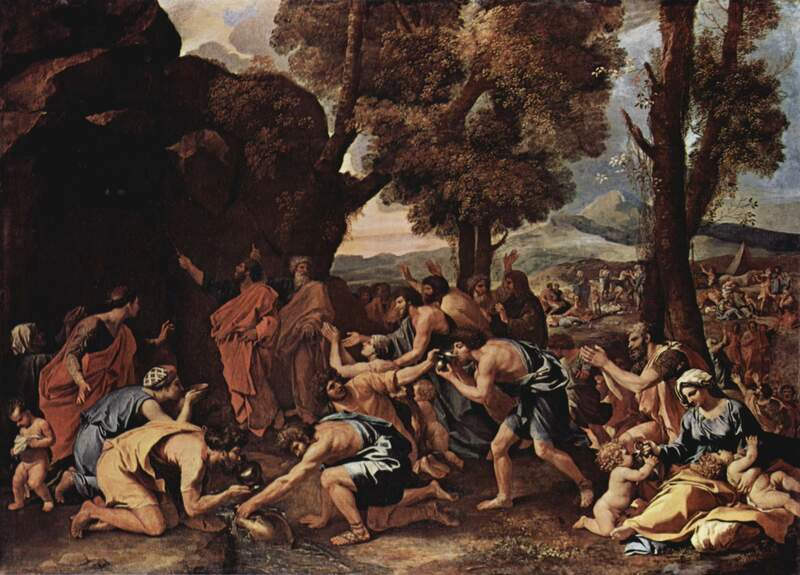 During the time of St. Paul Christianity was a Jewish sect, albeit one open to Gentiles. Furthermore, the Apostle was always Jewish. He dealt with issues of identity, some of which went back to the time of Abraham. Would permitting uncircumcised Gentile men to convert to Christianity without first becoming Jews threaten Jewish identity? Many Jews (including Christians) thought so. Passages such as the pericope from Romans took on greater and different significance after the formal split of Christianity from Judaism during the Second Jewish War in 135 C.E. Within Christianity the pericope remains significant. We, the Gentiles, have our own “Gentiles,” whom we define according to a variety of standards, including race, ethnicity, gender, language, culture, and physical capabilities. Labeling as outsiders those whom God calls insiders is sinful. It harms them and hinders the community of faith while making those who label narrowly feel good about themselves in the context of their imagined exclusive status. And most of us who call ourselves Christians have engaged in this unfortunate behavior or will do so, given sufficient time. May God forgive us, help us to do better, and create a more inclusive community of faith, for the glory of God. O God, you have prepared for those who love you joys beyond understanding. one God, now and forever. Amen. lift up your voice, rejoice, and sing…. A sense of having a covenant with and a special revelation from God ought not to lead one into spiritual and theological elitism, the religious equivalent of ethnocentrism, which is just as false as cultural relativism. Of course I condemn legalism and spiritual and theological elitism wherever they rear their ugly heads, but more importantly I advocate a healthy sense of ecumenism. I emphasize what I favor–loving one’s fellow human beings in the name of God and behaving toward them accordingly. For the Son of Man came not to be served but to serve, and to give his life a ransom for many. I, as a professing Christian, claim to follow Jesus. Thus, if I am to be an intellectually and spiritually honest Christian, I must serve others in the name of Christ, regardless of the human categories into which they fit. I retain definitions of true religions (Judaism and Christianity), merely false religions, and predatory cults, for I am not a Universalist. Yet my theology is ecumenical, drawing from Judaism and various Christian traditions. Those Jehovah’s Witnesses and Mormons (members of merely false religions) who come to my front door and whom I fail to avoid sometimes, do not understand this, for they think that they have the ultimate revelation of God. Meanwhile, I live in a home with crucifixes, a menorah, hymnals and service books from a range of denominations, and Bibles from Jewish, Roman Catholic, Eastern Orthodox, and Protestant backgrounds. I remain an observant Episcopalian, but other denominations fascinate me–some more than others. Lutherans and Moravians are especially interesting. There is God; no such beings as gods exist. Thus all of us are children of God, although many do not know that. To be an effective light to the nations one must, among other things, lay aside contempt for the people one hopes to convert. The failure to do so has been among the most grievous faults of many missionaries for centuries. They people who have set out to do something righteous have destroyed cultures and functioned as agents of imperial powers instead, for the shackles of ethnocentrism have chained them. Fortunately, modern schools of missions are among the places where one may learn how to avoid following in those footsteps. To be a light to the nations–or one’s community–is a great responsibility, one to approach with much reverence and humility. It is a goal one can accomplish only by grace and which requires the acknowledgment that one does not have a complete understanding of God. Nobody has such a grasp of the divine, but some of us have learned more of the truth than others. you lifted up this fallen world and rescued us from the hopelessness of death. with you and the Holy Spirit, one God, now and forever. Amen. The pericope from Numbers 20 (verse 22-29) is odd, for it seems redundant in the context of verses 6-13 of the same chapter. In both units God tells Moses and Aaron that they will not enter the Promised Land because of their act of rebellion and distrust at Meribah. Moses was supposed to speak to the rock, which would then release water. He struck it instead. Also, his words indicated that he and Aaron were providing the water, but God was actually fulfilling that role. Numbers 20:22-29 is a difficult passage for another reason, which is that the contradicts Deuteronomy 10:6, where Aaron dies at Moserah. In Numbers 20:22-20, Deuteronomy 32:50, and Numbers 33:38, however, Aaron dies at Mount Hor. These are different places, not two names for the same place. I mention these matters for the sake of intellectual honesty and leave the consideration of them to scholars of the Hebrew Scriptures. Water is essential to life. Those who dwell in a desert or another place where safely drinkable water is scarce know this better do those of who reside where safely drinkable water is plentiful. Water also functions as a metaphor in the Gospel of John, a veritable playground for metaphors. Our Lord and Savior speaks of spiritual water and spiritual life in John 3 and elsewhere in that Gospel. The source of the water in the Johannine Gospel is always God–sometimes Jesus in particular. Our life (physical and spiritual) depends on God. True, human beings contribute to related processes of creating, sustaining, and destroying life (in both forms), but we depend entirely on God all the time. May we know this truth and act accordingly, drawing closer to, trusting in, and glorifying God.